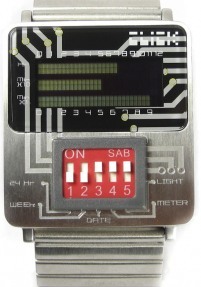 It’s the Click watch and it’s a standard digital timekeeper with either DIP switches or a tiny rotating switch that you use to set the features. Thats right – you need a small stylus or paperclip to look at the date on this thing. I get a kick out of nearly everything about this watch except that I can’t imagine when anyone would wear this in real life. The band looks like an IDE cable and it comes in multiple colors and styles including midnight black (for those late night LAN parties). It costs about $150-$175 and is available now at Watchismo. Click Watches have ingeniously re-appropriated these ‘retro-tronics’ into an entirely new way to show digital watch functions. Each mechanical switch activates a different function of the watch as seen in the diagrams in the product pages. Functions ranging from bar graph metered time display, 12 hour and 24 hour digital time display, month, date, day of week and backlight. Stainless steel casing 42mm x 35mm. This entry was posted in Authentic, Autograph, Fashion, wrist watch and tagged click, nerd, watch. Bookmark the permalink.